Although Fiat introduced the Nuova 500 back in 2007, 2011 is the first time the cleverly styled mini-compact is coming to the US. 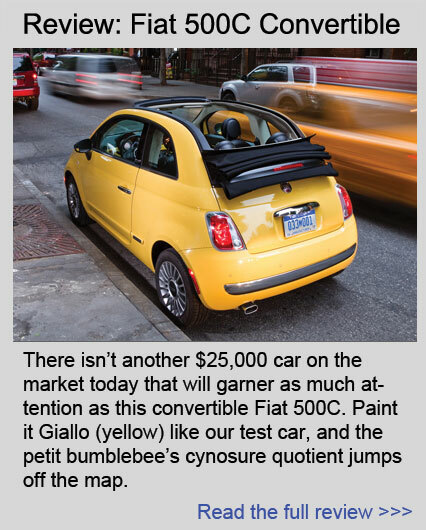 With its arrival, Fiat makes its return to the American market. The new 500 is styled after the original rear-engine Nuova 500 introduced in 1957. Although the new one is front-engine and front wheel drive, it looks like a giant next to the original city car. But that doesn’t mean it’s big in any way. The 2012 Fiat 500 slots in nicely between the Smart ForTwo and the MINI Cooper. I was super glad to see the manual gear shift when I first hopped in our test car. 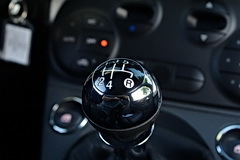 It’s so rare these days to see a car outfitted with a good old-fashioned 5-speed and clutch. More good news: there is a sport button on the dash. Must be the sport-tuned suspension on this Sport trim. Fire up the engine and it sounds a little underwhelming, but what do you expect from a 1.4-liter four banger? Put the 500 in first gear, step on the gas, and you quickly discover how rev-happy this little engine is. Drop it into second gear and you begin to smile. All of its 98 lb-ft. of torque comes on at 4,000 RPM and the 101 hp at 6,500. It’s really easy to redline this little machine without feeling like you’re stretching this engine. 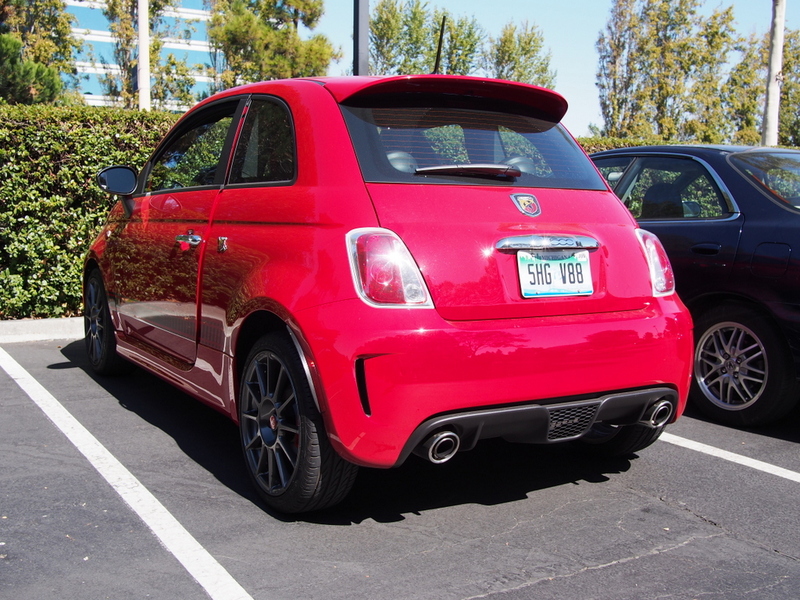 The 500′s stylish 16-inch wheels and all season tires are grippy and the car corners fairly well. I didn’t break a sweat taking freeway interchange ramps at speeds of over 55+ MPH. OK, maybe a little bit, but the 500 held on every time. With the huge sunroof open and the 1.4 liter happily revving in third gear, life in the Fiat Cinquecento (CHIN-KWAY-CHEN-TO) is good and you can’t stop smiling. As mentioned, the new 500 is reminiscent of the original Fiat 500 introduced in the late fifties and popular through the 70s. The original was truly a tiny city car, with a sub-500 cc engine that led to the iconic name. The new car does a really good job of featuring all the cute cues of the original, from the distinct hood to the cute headlights to the signature beltline and sloping rear window. It’s a great modern interpretation of the original, similar to the BMW-made New MINI of 2000, but the new 500 is definitely cuter than the new MINI. The 500 is also far more stylish than more mundane competitors such as the Mazda 2 and the Honda Fit. Driving this tester around Silicon Valley drew quite a few stares from passersby, and I felt pretty smug in it. The driver’s seat is comfortable and the levers are easy to reach. Same goes for the front passenger seat. There are armrests that come in handy, especially since the beltline is relatively high on this little car. The steering wheel controls are easy to learn and use, as are the dashboard-mounted controls for the radio and climate control. One complaint I do have is about the radio controls. Both the volume and tune controls should be turn knobs instead of the up and down buttons, which drove me crazy when trying to adjust volume or change stations. The shifter is well placed and easy to control, and the gauges are nicely designed. 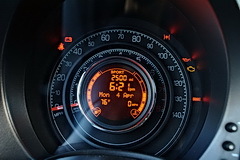 The speedometer wraps around the tachometer, which itself warps around an LCD display in a circular layout that is both space-saving and cool to read. Controls for windows are mounted on the dash, adding a bit of Euro flair, but this will probably illicit a double take from most Americans.